Editor's note: a modified form of this post originally appeared at Bless You Boys on May 22, 2015. It has been updated with 2016 statistics. I'm glad our 20th (or possibly ninth) President of the United States has asked this question, because it provides a perfect lead-in for this post. There are, in fact, two very useful advanced metrics that not only do a great job of measuring true pitcher value, but are also nearly guaranteed to make sure you never get invited to a party again. You would think, if ERA is really that inadequate of a statistic, that ERA+ would be even more inadequate, because it sounds like it's just more ERA. That's what "plus" means, right? Well, no offense, but, that is why you are the one reading this post, and I am the one writing this post after having just now, 20 minutes ago, looked up what ERA+ even is. This fancy metric takes your traditional, run-of-the-mill ERA statistic, then pimps it out with adjustments for league-average pitching and ballpark factors. "Why are those two factors important," I can hear you asking, because you said it a little louder than was necessary. I'll explain. Imagine an anonymous pitcher who goes to his first Alcoholics Anonymous meeting and has to say, "Hi, I'm Chadwick Flingflonger, and I'm an alcoholic," so now we all know his name, which makes you wonder why they call it Alcoholics Anonymous in the first place. Let's say Chadwick finishes out his pitching season with an ERA of 3.60, which seems like a pretty decent ERA. Except, it's not, because Chadwick is pitching in a golden period of Dominant Pitching, and the league average is actually 2.75. So, really, Chadwick's 3.60 ERA is pretty god-awful, which is probably why he has a drinking problem. Or, take the case of another fictional pitcher, Vladamir Yztwrcja, whose last name is pronounced "Jones." Vladamir is really struggling with an ERA of 5.60, and this depresses him to the point of wanting to leap out a window. That is, until someone points out that Vladamir pitches half of his games in Matchbox Park, where the outfield wall is so shallow that the shortstop regularly bumps into it while trying to field routine grounders. In a normal ballpark, Vladamir's ERA would be much, much lower. What this tells us is that ERA+ is capable of figuring out who has substance abuse problems, and can also cure depression. It's a miracle stat, and it also comes with the advantage of not being decimal-based. That's right, ERA+ is baselined at 100, and only operates in whole numbers. Here are the best Tigers pitchers' seasons by ERA+ in the last 50 years. 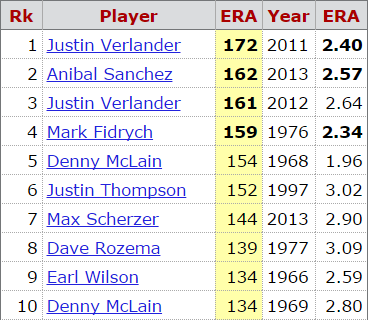 Notice that Justin Verlander's 2.40 ERA in 2011 ranks higher than Denny McLain's 1.96 ERA in 1968. That's because the league average ERA in 2011 was 3.94, whereas in 1968 it was 2.98 -- in other words, in relation to other American League pitchers, Verlander's ERA was 1.40 runs better than average, and McLain's was 1.02 runs better than average. Also notice that ERA+ accurately predicted Denny McLain's involvement with cocaine. Most people, when they see "RE24," think that it refers to the most frequently used subject line in emails sent to Kiefer Sutherland. But in fact, RE24 is probably the single most useful pitching stat on the market, especially when evaluating relievers. It's easily my favorite pitching stat, and not just because it so handily lent itself to setting up that hilarious 24 joke. The "RE" stands for "Run Expectancy," and the "24" stands for a complicated math concept, so I'm going to skip right over it and just repeat that "RE" stands for "Run Expectancy." This metric actually applies to both hitters and pitchers, but in opposite ways. Basically, every situation in a baseball game has an expected number of runs attached to it. If the bases are loaded with nobody out, there is a Run Expectancy of a little over two runs. (Unless it's the Tigers in 2016 with the bases loaded, in which case Run Expectancy is automatically replaced with Are You Freaking SERIOUS Expectancy and baselined at an average of negative infinity.) If there are two outs and no runners on base, the Run Expectancy is about one-tenth of a run. What the RE24 stat does -- for pitchers, anyway -- is to take the runs expected in any situation, and award them to the pitcher if he successfully prevents runs from scoring in that situation. To use the above example, if a reliever comes into the game with the bases loaded and nobody out, the Run Expectancy is 2.3 runs. If he retires the side without allowing any runs to score, those 2.3 runs are credited to his RE24. "But," you ask, because clearly you don't give a fart that I'm trying to write an article and don't have time to talk, "why is this stat so useful for relievers?" Because it accurately spreads the credit and the blame to all the pitchers involved, in a way that ERA does not. Take the game against the Blue Jays on July 7 of 2016. 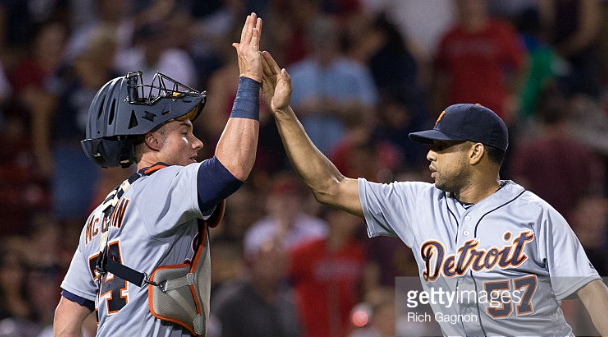 In the eighth inning, Justin Wilson loaded the bases and was replaced by Alex Wilson (instead of K-Rod, because Brad Ausmus is a lunatic, but that's a separate post). Alex Wilson gave up a two-run single (scoring two of Justin Wilson's runners) and then recorded the final out of the inning. In traditional terms of ERA, Justin Wilson was charged with the two runs and saw his ERA jump from 3.19 to 3.62, while Alex Wilson's ERA went down from 3.72 to 3.68. But in terms of RE24, Justin Wilson scored a positive 0.50, and Alex Wilson was rightly charged with the more damaging -1.22. And if that level of additional accuracy doesn't do much for you, then just remember that RE24 = Jack Bauer jokes! Come on, what more do you need? 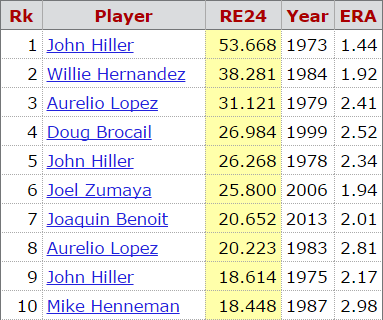 The baseline for RE24 is zero, which means if a pitcher has an RE24 of five, he's worth five (prevented) runs above the average pitcher. Here's another chart that shows the top ten Tigers relievers' seasons by RE24 in the last 50 years. Yes, I miss Joaquin Benoit too. 1. How awesome would it be if there really was a pitcher named Chadwick Flingflonger? Show your work. 2. Are you ready to give up relying on ERA yet? Express your answer in terms of agreement relative to how long you've been getting AARP discounts. 3. Is there a correlation between lousy RE24 stats and beard length? Demonstrate using a pie chart. 4. Remember Juno email? LOL.